The peak oil theory lead investors to believe that oil prices would rise as oil supplies became depleted. Thirty-two years after crude oil futures began trading on the New York Mercantile Exchange, prices have risen at a compounded rate of about 1.8%, less than inflation. I created a quantitative, systematic Long/Short index and applied it over "In-Sample" and "Out-of-Sample" periods. 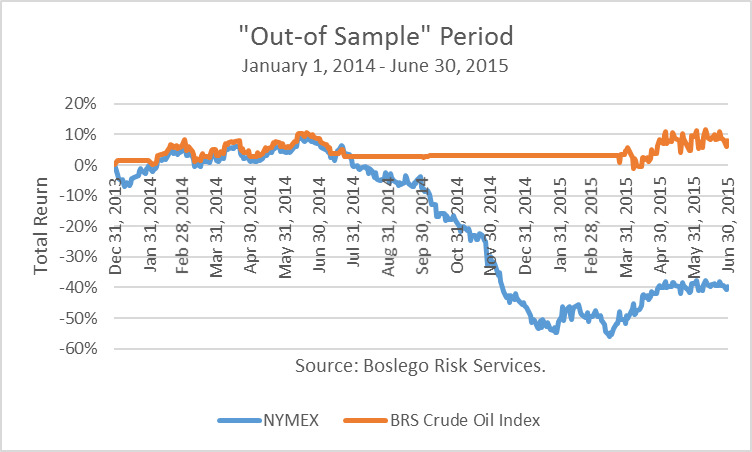 The Index risk and returns are far better than buying-and-rolling a long crude position. The Index has recently gone short. "Peak oil" is a theory that refers to a point in time when the maximum rate of extraction of petroleum is reached. Once it is reached, the rate of production enters terminal decline. The conventional wisdom was that crude oil prices would inevitably rise ever higher as supplies were depleted. "Oil in the ground was more valuable," providing a high return over the long-term. When crude oil futures opened on the New York Mercantile Exchange (NYMEX) on April 4, 1983, the front month settled at $29.44. On July 7, 2015, the front month settled at $52.74. A rough calculation, without accounting for rolling costs or basis gains/losses when rolling the position from one front month to the next, results in a compounded gain of just 1.8% per annum, less than the rate inflation of about 2.4%. Not only was the long-term return poor, the ride would have only been enjoyed by thrill-seekers. The maximum drawdown-from-peak was 77%. In The Intelligent Investor, Benjamin Graham states, "the essence of investment management is the management of risks, not the management of returns." At the heart of this approach is loss minimization, deliberately protecting oneself against serious losses. Warren Buffett described this book as "by far the best on investing ever written." My approach, which I call Vertical Risk Management (VRM), is to separate emotions from investment decisions by running an algorithm that provides systematic, quantitative signals. I first developed this particular model about five years ago and have applied it to different markets, such as the equity market. The algorithm was developed based on a paper with the title above written by Nobel laureate Robert J. Shiller. In this paper, he discusses the failure of the efficient markets theory to explain stock market prices and the "blooming of behavioral finance." In particular, he describes one of the oldest theories about financial markets, which he calls price-to-price feedback theory. Essentially, he argues that the emotions of greed and fear drive market prices far too high on the upside, and much too low on in downturns. I developed and tested hypotheses to try to quantify conditions that might make investors feel greedy and fearful. And it turns out that the size of market gains and losses, combined with the speed, does a pretty good job in determining when to be long, when to be out, and when to get short. By applying the same VRM algorithm systematically from 1983 through 2013, the "In-Sample" period, I created the BRS Crude Oil Index (BRS stands for Boslego Risk Services). Note: All of the SEC disclaimers at the end of this article are important to read about any such Index applied retrospectively over historical data. The total return of the Index during the "In-Sample" period was 893%, with a maximum drawdown from peak of 40%. This compares to the total return from a buy-and-roll position of 207% with a maximum drawdown of 77%. The "In-Sample" period refers to the period in which the algorithm parameters may be adjusted to achieve different levels of risk and return. In the "Out-of-Sample" period, the same parameters that were set in the "In-Sample" period must be used. 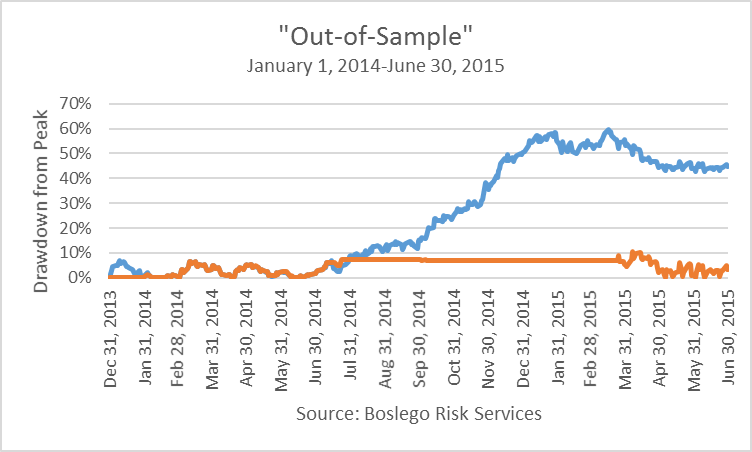 I calculated the Index for the "Out-of-Sample" period, January 1, 2014 through June 30, 2015. 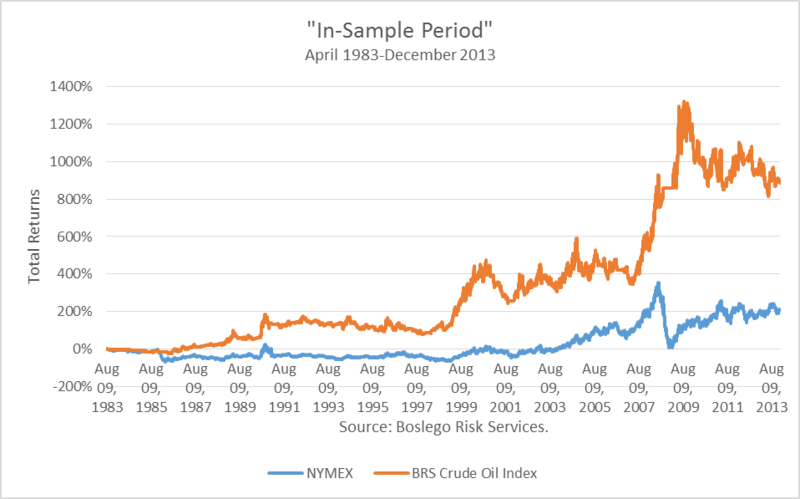 This has certainly been among the most volatile periods in the past 32 years of crude futures trading. The Index gained 9.5% and the maximum drawdown from peak was 11%. That compares to a loss 39.5% from the buy-and-roll strategy and a maximum drawdown from peak of 59%. Beginning July 6, the Index position has shifted from a long to a short position, and as of July 10, 2015, is 50% short. 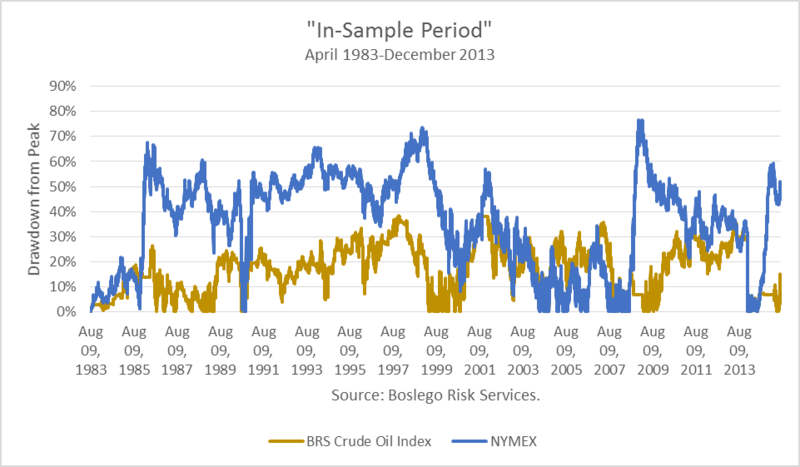 The conventional wisdom decades ago, and to some extent today, was and is that long crude oil positions would provide a good return over time and was and is a good hedge against inflation. The reality has been that crude oil returns have actually lagged inflation. 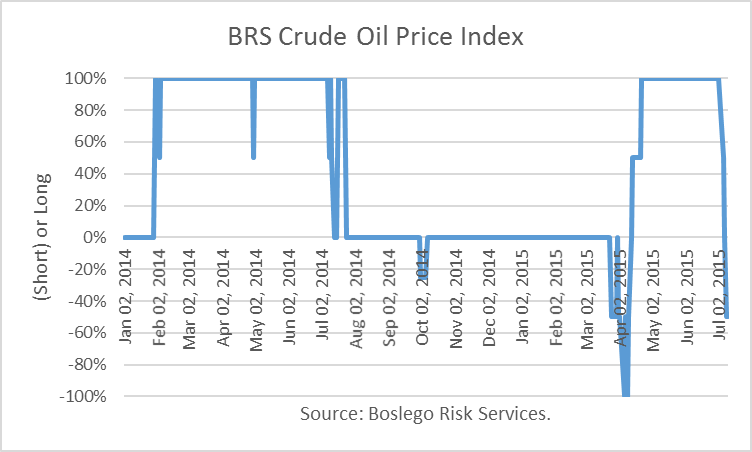 The BRS Crude Oil Index demonstrates that to achieve a good return in the crude market, an investor must be willing to reallocate positions from long-to-short. Oil prices are inherently difficult to predict, but price predictions are not necessary using the VRM algorithm. It is designed to risk-manage when it detects the start of a falling market which may result in a collapse based on the "fear" factor. Equally important, it repositions to a long position after it detects the "fear" regime is over. This material is provided for limited purposes. It is not intended as an offer or solicitation for the purchase or sale of any financial instrument. References to specific asset classes and financial markets are for illustrative purposes only and are not intended to be, and should not be interpreted as, recommendations or investment advice. The opinions expressed in this article represent the current, good-faith views of the author(s) at the time of publication. The views are provided for informational purposes only and are subject to change. This material does not take into account any investor's particular investment objectives, strategies, tax status, or investment horizon. Investors should consult a financial advisor for advice suited to their individual financial needs. The author cannot guarantee the accuracy or completeness of any statements or data contained in the article. Predictions, opinions, and other information contained in this article are subject to change. Any forward-looking statements speak only as of the date they are made, and the author assumes no duty to update them. Forward-looking statements are subject to numerous assumptions, risks, and uncertainties. Actual results could differ materially from those anticipated. Past performance is not a guarantee of future results. As with any investment, there is a potential for profit as well as the possibility of loss. The information presented in this paper relates to the creation and testing of investment models and the use of backtested performance data. Back-tested results are calculated by the retroactive application of a model constructed on the basis of historical data and based on assumptions integral to the model which may or may not be testable and are subject to losses. Hypothetical performance results have many inherent limitations, some of which are described below. No representation is being made that any account will or is likely to achieve profits or losses similar to those shown. In fact, there are frequently sharp differences between hypothetical performance results and the actual results subsequently achieved by any particular trading program. One of the limitations of hypothetical performance results is that they are generally prepared with the benefit of hindsight. Back-testing allows the security selection methodology to be adjusted until past returns are maximized. In addition, hypothetical trading does not involve financial risk, and no hypothetical trading record can completely account for the impact of financial risk in actual trading. For example, the ability to withstand losses or to adhere to a particular trading program in spite of trading losses are material points which can also adversely affect actual trading results. There are numerous other factors related to the markets in general or to the implementation of any specific trading program which cannot be fully accounted for in the preparation of hypothetical performance results and all of which can adversely affect actual trading results.